A couple of weeks ago, the Royal Society of Arts (RSA) held its own festival for all those involved in making things. Simon Cook and I went along to promote the activities of the UK Open Source Hardware User Group (OSHUG), alongside Andrew Back, who was demonstrating the open source electronics collaboration platform, SolderPad. The event was held in the basement of Somerset House in London, and while Somerset House is a very grand building, its basement is the old HMRC post room and is anything but grand, which served to encourage a very informal atmosphere. The RSA was explicitly reaching out to organizations, communities and individuals involved in “making”. So we had businesses selling kits, schools demonstrating hands-on technology, universities showing how they’re engaging with the community, voluntary bodies promoting technology and craft, groups promoting repair rather than replacement, and numerous individuals showing what they do. It can be summed up in three words: craft, environment and community. East Barnet School were present in force, showing their award winning robots, along with a range of projects developed during their technology classes. A combination of strong teaching and committed support from local engineering and technology businesses makes this possible, and the success can be seen in the confidence with which teenagers can talk to the public about their work. Indeed, they have been so successful that shortly they’ll be selling their own robot kit design to other schools. Several organizations focused on the environment. Both The People’s Design Lab and The Great Recovery project are about creating a culture where we design for sustainability and reuse, and where manufacturers have an incentive to avoid obsolescence. A personal favourite was the hands on demonstration from groups showing how common consumer goods that appear to have broken can be repaired, often for very little money – that broken laptop may only needs its on-board battery replaced. 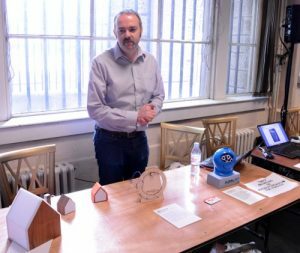 Adrian McEwan showed the fun side of making, with his own Bubblino, along with Good Night Lamp and Wheredial. The Bubblino in particular always entertains me—an Arduino, Android phone and bubble blowing machine linked together to blow bubbles whenever a particular hashtag is seen on Twitter. But Adrian also addressed the more serious issue of the great gap between making things as a hobby and then stepping up into manufacturing. And finally, 14 year old Amy Mather impressed with her talk on learning to use a Raspberry Pi. Two things struck me from her talk and meeting her afterwards. First that she seemed to find electronics “obvious” — it was working with the computer that was her challenge, and secondly that her success was due in strong part to very supportive parents. As professor Bill Lucas pointed out at the rather more serious evening debate, 200 years ago, there was a fourth ‘R’: wRoughting; the ability to make things was seen as one of the key capabilities of any individual. Maybe in our modern society that ‘R’ is coming back. You may be wondering at why the RSA should be so interested in a subject that is often seen as “technology”. In fact the organization’s full title is “The Royal Society for Arts, Manufactures and Commerce”, so making things is very much what it was founded for in 1754. In its own words it is “…an enlightenment organisation committed to finding innovative practical solutions to today’s social challenges”. There’s more on what happened at FutureMaker on their web site, and lots of pictures on Tumblr.